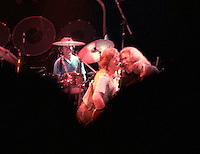 I just added two more shots to the Scenes from the Grateful Dead Concert at The Saratoga Performing Arts Center, SPAC, on 24 June 1984. The original 6 inside the venue were chosen from the one roll of high speed color negative film. The new two are slides I found, all by themselves in a file sleeve. There are probably more of the crowd in the archives. When found I'll post anything new. The one shot that makes this show gallery unique to me is the rare photo of Jerry and Phil singing together into a single mic. Only other time I can remember something like this was with Bobby, Jerry and Donna signing into one mic in Blacksburg VA April 1978. Shot on Kodak CF135-36 film stock. The film was pretty grainy though I determined it to be the best hand held camera concert color emulsion based on sharpness, speed and dynamic range available at the time.